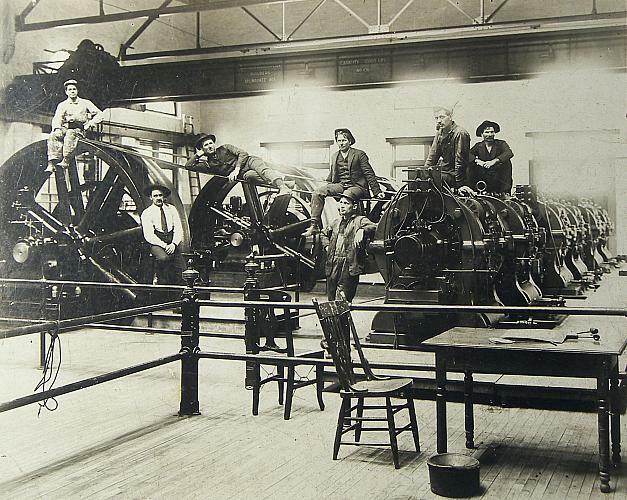 Three employees of the Street Lighting power plant pose on top of the electric generators, two are on the belts, and two lean against the large wheels. A wooden table and chair are behind metal railings that enclose the generators. A spitoon is on the floor in front of a table and a corncob pipe rest on the tabletop. Two of the men hold pipes in their mouths. The room is lit with electric lights. The flooring under the table is wood, but the generators sit on a raised platform. "Builder, Milwaukee, Wis" and "capacity 12,000 lbs.) are written on the beam at the back running across the photo near the top edge. Photograph 10 1/2 X 14 in. Title by cataloger. J. H. Packer, State View Photographer, Rm 84, Porter Blk, Grand Rapids, printed on back. The engine and dynamo room can be located on the diagram of the city lighting plant from the 1899-1900 Grand Rapids Annual Report of City Departments. For a photograph of the plant and other interior photos see other images in the online archive under the subject heading, Street Lighting.